Leave a comment below to sign-up. You can list the books you intend to read if you’ve already decided. For those with blogs: write a post on your blog about the challenge (with or without your list) and link to this post. Reviews of books read are not required but are encouraged especially for those with blogs. Please share your reviews with the rest of community the on Reviews Page. If you do not have a blog and would like to guest review on this blog, then please feel free to contact me. Likewise, completion posts are encouraged and you can share those on the Completion Page. Some classic African literature can be hard to find. Please check your libraries and use inter-library loans if you have access to such services. You will be able to do this challenge with the books currently available on the market. I will publish lists of reading materials under various themes until I tire of the process. Please contact me at kinnareadsATgmailDOTcom if you need any help. Ghanaian Literature Week – I have hosted this event for the past two years. So you could save your GhanaLit reads for then. Maybe a readalong or two. I will announce those in the coming months. You can subscribe to this blog (see top of the right sidebar) to stay updated on this challenge. That’s it. Let’s enjoy reading for the 2015 Africa Reading Challenge. Well done Maamej.Such a good set of bok you read of the 2015 challenge. I’l be announcing the 2016 soon in case you are interested :). Thanks for participating. An African book club on AU radio is a fab thing. Thanks for participating. Just came across this blog and post and absolutely loved this challenge initiative. Would there be a 2016 challenge? Yep. I will anounce it soon. I can’t script what’s to come, but I expect to read these by the time the year is out. Wish me luck! A fellow Guardian (UK) poster introduced me to this Blog, and inspired by my Ghanian mate, and African neighbours , I feel encouraged to engage in the challenge, I have started reading two Ghanian e books, The Prophet of Zonga Street, by Mohammed Naseehu Ali, and Diplomatic Pounds by Ama Asa Aidoo, both short story collections. I have enjoyed the wit, wisdom and style of what I have read so far. Thanks for coming by. I hope you find more here to get you reading more African literature. I added my name to the list in June and forgot about this challenge (a trip to South Africa followed by a heart attack clouded my memory a little). I have not written a post about this challenge but I plan to. I have already read at least 12 books from South Africa this year and one from Rwanda, but I do want to spread my reading out before year’s end with something from North Africa (I just acquired 3) and a few other countries on my agenda. Is it okay to post when I feel I am satisfied with my accomplishments? Yes, you have until the first week in January 2015 to post or come here to tell us about your progress thus far. Enjoy your reading. Wow and quite the list of books. I periodically post lists with various books from around Africa. I hope you find more to broaden your reading of Africa. Thanks for coming by and visit often :). Did you see where Chigozie Obioma’s book “The Fishermen” (Nigeria) made the Man Booker Shortlist? It’s a good book, a bit confusing in places but definitely worth the read. Best “Africa book” I read this year was Maps by Farah Nurruddin (Somalia). I have The Fisherman on the my TBR. Oh, Maps is one of my favorite books. I don’t talk a lot about the books that I read pre-blogging but I should. I love Farah’s books. Great job you’ve been doing Kinna!! It’s mid-year and I just got to know of this wonderful initiative but please count me in! Thank you for doing this for Ghana, for the Continent and for the World. I doff my hat . . . Can a woman do that?? well, I just did! Thank you for the kind words. You are counted in. Having just completed a round of reading nominees for the major translated book awards, a trip to South Africa within a week and a collection of titles by some African International Booker nominees I imagine I can step in at this point and aim to meet this challenge. I’m glad I discovered this! Hi, just got some feedback from people who were looking for the comments thingy and did not see it, probably because they had to scroll right down to the bottom. ;-( is ther any way you could put this at the top – have recent comments at the top rather than oat the bottom? Thanks for the heads-up. I’ve changed the settings so newer comments will show at the top of the thread. Thanks for signing up, Phillippa. And I love the idea of a themes for a book club. Enjoy your reading! I am looking forward to your list of recommended books. This is a fantastic idea! We’ve only read books by our dear Igbo woman, Chimamanda so it would be great to branch out! Currently reading the comments to get some inspiration of where we should start. Once we’ve read those books we’ll make a post and link your page. I am up for the challenge too. I started doing a “read the world” challenge although that will take me several years to do. In the process I noticed how few books I had read by African writers so want to correct that (probably only read half a dozen or so other than Arabic ones). I have lined up Mia Couto A River Called Time, Jose Eduardo Agualusa The Book of Chameleons, Tayeb Salih A Season of Migration to the North and have started Ngugi Wa Thiong’o Weep Not Child but on the look out for further recommendations. Great list! I have only read 15 so will get it started from today! I can’t say I am familiar with African literature, but you have peaked my interest. I am a doctoral candidate, and always looking for something new to stimulate my mind. All the best to the other challengers ! 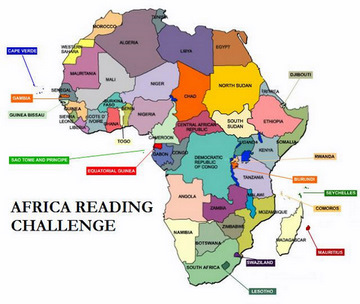 Hey Kinna heads up, my first Africa Reading Challenge post is up! Come check it out and take a trip to Kenya! I’ll be sure to blog about the books and the challenge: hhttps://fraeuleinstern.wordpress.com/2015/02/11/2015-africa-reading-challenge-first-ideas/ or http://fraeulein-stern.blogspot.de/2015/02/2015-africa-reading-challenge-first.html (I usually write in German, but I’ll do English posts about the Challenge as well). So, basically, I just need two more African-authored books and I’m set. I want to participate! As a postgraduate in Comparative Literature I love to explore the world of literature! It would be great to get to know the diverse range of African literature! But I have to admit, I am a complete newbie to African literature. So could you please recommend some books, so I can get in touch with your authors? Sign me up! Last year I read just one Africa-related book. This year I’m going to redeem myself be reading more!! Thanks for hosting!!! I am joining as well! It’s a pleasure to join such the interesting challenge of such unknown land :). A Pied au Nord Somali: Grenier d’Aromates des Pharaons. You signed up with your comment. Yep, that’s what I did. 😉 Is this my warm welcome? LOL! I see your earlier message and will be thrilled to have you in “My Kind Of Mystery”. WordPress users in general are having problems with linky buttons. Mine are hard to see but work. I am searching new options. Carolyn. Welcome RIEDEL, to the challenge. I will sign up for your mystery challenge. Enjoy your reading! Welcome to the challenge, Rebekka. Please come back and post on your progress. I will publish post quarterly so that we can all discuss our progress. Enjoy reading Africa. Wow, wow. I love your plan> Plus I have never heard of Kpomassie who’s an explorer! Who knew. Thanks for participating in the challenge again. The Wizard of the Crow is one of my favorite books but I’ll leave you to judge for yourself :). Looking forward to your reviews. You’re off to a good start! Wizard of the Crow intimidates me a bit, but I’ve heard such great things about it that I really want to read it. Maybe putting it on this list will help give me the push I need. I’m jealous that you’ve read Kintu. I want to read that so badly. I hope you post on your impression of the book. Welcome to the challenge. Your reading list looks superb! Hi – this looks fascinating! We are moving to South Africa this year so thought this would be a good one for me. I have already read a couple of African books including the Africa House (http://www.amazon.co.uk/The-Africa-House-English-Gentleman/dp/0140268340) and Under Our Skin (http://www.amazon.co.uk/Under-Our-Skin-Familys-Journey/dp/1849831378). Does books that we read to our children count? We are currently going through the books by Lauren St John – the White Giraffe, Dolphin Song etc. I am looking forward to participating. Welcome to the challenge. Yes, books that we read to our children count. Enjoy reading Africa and please do come back to post on your progress. Naturally, I am up for this. I just finished reading Camara Laye, “The dark child” which has been on my TBR list for quite a long while. Ei, I have Laye’s book on my shelves. Not sure if I’ve read it. Been awhile, Nina. Thanks for signing up. I hope that we run into each other real soon. Thanks for the challenge. As I’ve recently moved to Malawi I have set myself the challenge of reading more African literature, so your blog will give me ideas for books and keep me motivated. I would recommend The Boy who Harnessed the Wind (reviewed on my blog: https://malawimoments.wordpress.com/2014/11/04/the-boy-who-harnessed-the-wind/ ). Welcome to the challenge and thanks for the recommendation. I’ll be posting some more lists and recommendations in the coming weeks. Enjoy all your reading this year! You have also inspired me to start my own challenge – an Indigenous reading challenge, which I hope will encourage people to learn more about Indigenous people. Happy new year! Happy New Year and welcome to the challenge. You’re off to a great start. Yes, I have Foreign Gods on the TBR and will be reading it this year. I will check out your Indigenous Reading Challenge. Enjoy reading Africa! I’m pretty familiar with African Literature but I’d like to read more. I’m in again for 5 wherever the interest leads me – likely all African authors and likely a couple of nonfictions. I have a blog – I’ll post the page when I finish the books. Thanks for doing this Kinna. Welcome to the challenge, Becky. I look forward to your reading list. Enjoy the challenge! Thanks for doing this again. I rely on you and the Challenge to guide my reading of books by African authors. You have lead me to many excellent books. Keep up the good work. Thank you for the kind words, mdbrady. And welcome to another year of reading Africa.